It has been more than a month since 35-year-old Helen “Ashley” Hamm, of Leonard, went missing. 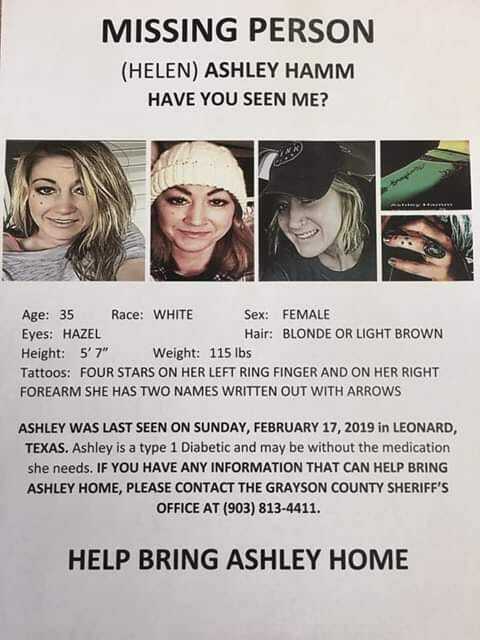 Fannin County Deputies say she’s a diabetic, and may not have her medicine. She is 5′-7″ with shoulder length blonde or light brown hair, has tattoos on her right forearm and left ring finger. Hamm’s family met with Fannin County Commissioners Tuesday to discuss the case. The family ha offered a $2000 reward.